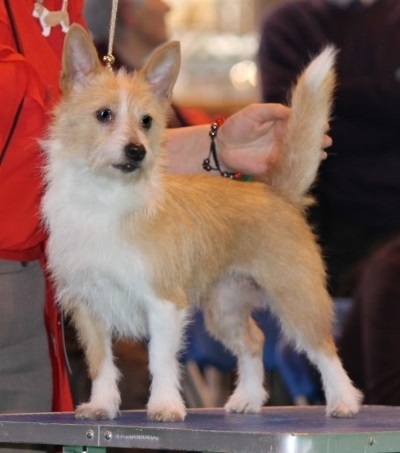 The Portuguese Podengo Pequeno, a smart and versatile breed, with erect ears and a wedge-shaped head. 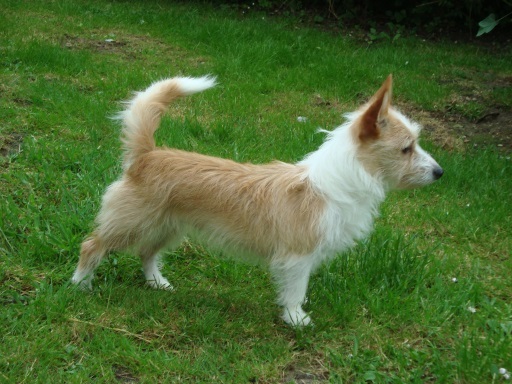 It is the smallest of the three kinds of Podengo and comes in two coat types which are smooth or wiry. A rabbit hunter by occupation, it has been around almost unchanged for 2000 years making it one of the oldest living dog breeds. It’s unique ability to hunt using three senses makes it different from many of the other members of the Hound Group that are usually classified as either scent or sight hounds. While breed records were non-existent 2000 years ago, it is assumed that members of this breed are related to the Pharaoh Hound, Ibizan Hound, Cirneco dell'Etna and Basenji. This breed has ancient roots that date back more than 2000 years. The breed was likely brought to Portugal by the Phoenician traders from Asia Minor and accompanied Romans during their conquests. They can be seen on bas-reliefs on ancient churches. It is thought that they were developed from canines that inhabited the North African deserts and share a common ancestry with Ibizan and Pharaoh Hounds, as well as with the breed's much larger cousin, the Portuguese Podengo. 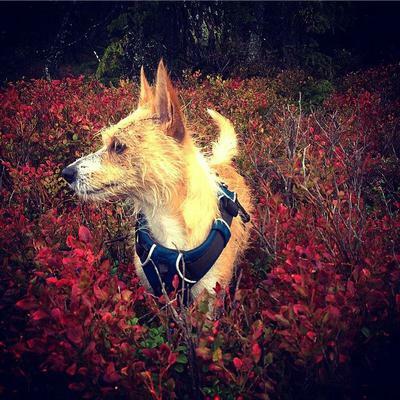 The name, Podengo is a word used in Portuguese history to refer to a dog that hunted in packs. 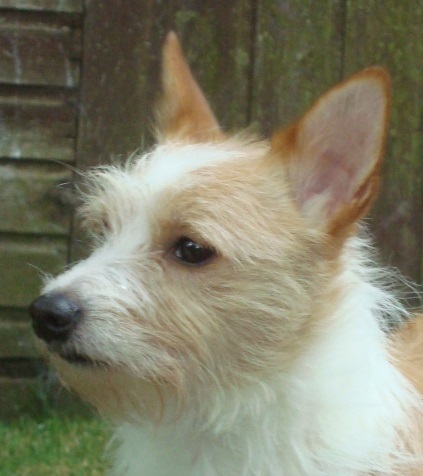 The Podengo Pequeno was a rabbit hunter but also searched for a small quarry in rocky, mountainous terrains. 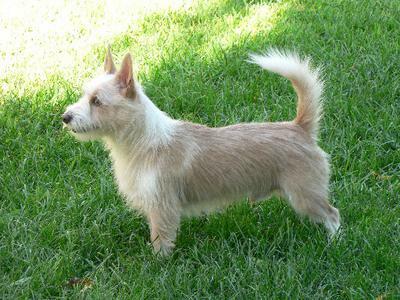 The Pequeno means “small” and, in this case, the dogs reach between 8 and 12 inches at the withers. They were appreciated by farmers and country squires for their tough, tireless hunting abilities. Like other Mediterranean hounds, Podengos these dogs can use three senses, sight, scent, and hearing to hunt. In the 15th century, small Podengos were taken aboard the ships such as those of Christopher Columbus and other explorers. The dogs’ job was to keep the ships free of rodents and thus protect the food stores and the sailors from contracting a vermin-borne disease. Though acknowledged as a distinct breed since the 10th century, it wasn’t until 1954 that they were finally recognized as Portugal’s National Dog Breed. 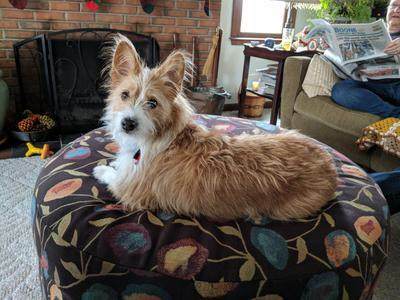 The Portuguese Podengo occurs in three sizes: The Podengo Grande measures 22-27 inches, the Podengo Medio measures 20-22 inches, and the Podengo Pequeno and the one which this article focuses on, measures 8-12 inches and weighs 9 to 13 pounds. They were brought to American in the 1990s and immediately became noticed by a dedicated group of individuals. 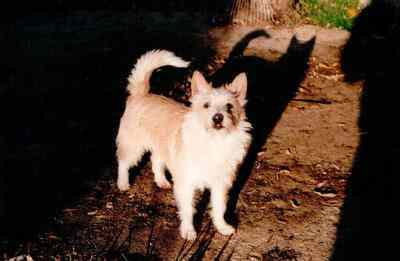 They formed the Portuguese Podengo Pequenos of America (PPPA) which became the parent club. 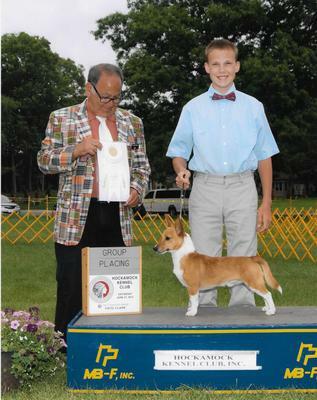 The breed was accepted into the AKC Miscellaneous Class in 2011 and then entered the Hound Group in January 2013. 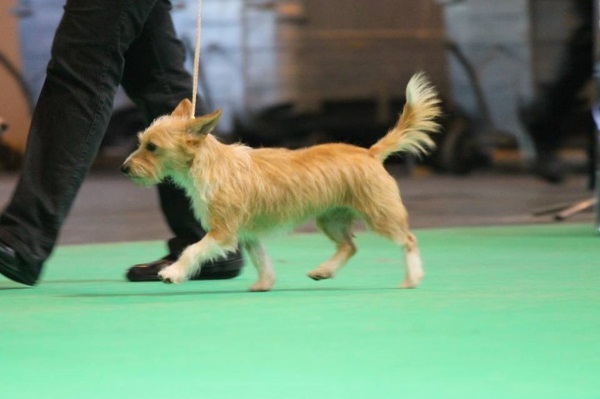 They are AKC’s 177th breed and hold the rank of 160th in popularity in the U.S. in 2015. 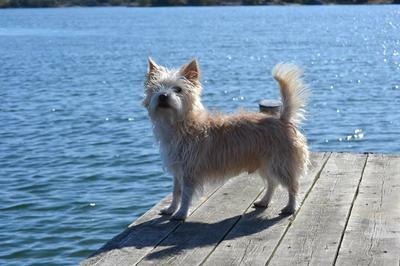 These dogs are lively, independent and highly intelligent. They are loving and love to please their owners, but they are not lap dogs and don’t fall into the category of couch potatoes. They love to run and play, but should remain within a securely fenced in yard as they can take off if something pops into their line of sight, scent or hearing range. They do well in a variety of settings including urban, suburban and rural. If no yard is available for a fun romp, they need daily walks and playtime. While still used for their hunting ability, their social nature has made them a great companion dog. They retain many of their working dog skills such as stamina and resourcefulness, but they aren’t as aloof as their larger cousins. Besides being an excellent companion, they also serve as a good watchdog. 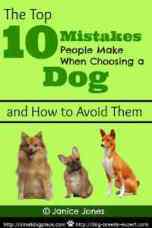 People are also finding that these dogs do well in canine sports including agility, lure coursing, and flyball. There are two varieties of coat types, the smooth and harsh, wiry coat. The smooth coat is short and very dense while the wire coat is long and harsh. The coat consists of a single layer with no undercoat so groom is relatively easy. The smooth variety is very easy to groom, whereas the wiry coat requires a tad more grooming. Other than nail clipping, teeth brushing, and the occasional bath, smooth coats are easy to care for. Their wiry coated brothers need just a little more grooming. A weekly brushing is recommended to remove any dust or dirt from the coat. Their nails need to be trimmed and their ears checked periodically. Hair will need to be removed from inside the ears as a buildup of hair can foster infections. Hairs can be plucked by hand, tweezers or a hemostat hair puller or you can have a professional groomer do this task. A few hairs need to be removed from the corners and around the eyes so that hair does not interfere with vision or touch and irritate the eye. Teeth should regularly be brushed using a dog toothpaste. Bathing is infrequently done. Unless the dog becomes extremely muddy or foul for some reason, a bath about every 3 to 6 months is fine. Since the coat is waterproof and repels dirt, it’s recommended that more frequent bathing will damage and soften the coat. Trimming is not recommended as it will ruin the natural look of the wire coat. 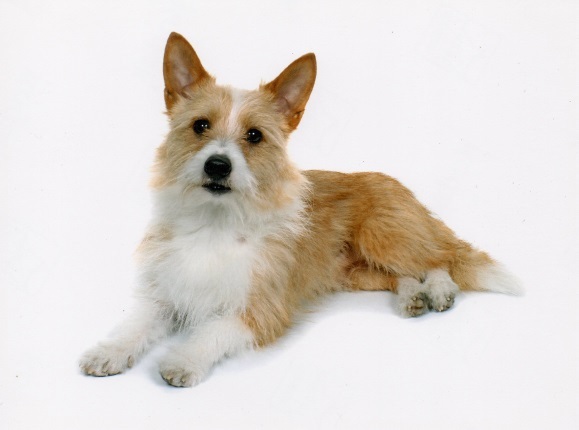 The Portuguese Podengo Pequeno is a sturdy dog that lives upwards of 15 years. 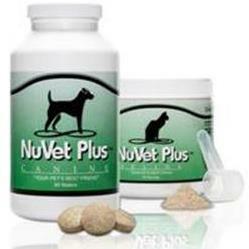 It is a very healthy breed with few genetic problems. As with any breed, the chances that your puppy will have any of these problems is slim, but I think it is important for anyone considering the breed to be aware of potential issues that could arrise. My Podengos are my loyal companions. Wire Hair Portuguese Podengos from Viamonte, top Podengo breeder with dogs in 21 different countries worldwide. The Podengo Pequeno is the best comedian! Shared With Small Dog Place by his owner, Megan Welter from Massachusetts. "Chewy came to us as a rescue from animal control. One day a lady stopped her car on the side of the road and yelled through the window, you have a Portuguese Podengo Pequeno. She was right. He solves problems and has many opinions. Can jump 5 feet in the air and loves to swim." The Portuguese Podengo Pequeno emits a high-pitched bark when coursing its prey known as the 'Maticar,' which allows the hunters to know where the dogs and prey are located.